The beaches of Manitowoc were stormed by nearly a dozen, four person teams on the sunny and unseasonably warm Saturday afternoon of February 4th. Fat-bike aficionados were invited by The Broken Spoke Bike Studio, The NEW OM(NorthEast Wisconsin Off-road Mountain) bike club and Pabst Brewing Company to dirty their tires on the sand, mud, ice and slowly melting snows of Manitowoc’s soon to be infamous “Shelltrack.” The eclectic group of riders were made up of veteran fat-bike racers, outdoor enthusiasts looking for a way to take advantage of the midwinter thaw and first timers pulled from the ranks of the spectators and coaxed into racing. The Shelltrack is a one mile loop of beach, single-track, and a few manmade bridges, complete with a risky shortcut penalizing (or rewarding) the rider with an ice cold PBR to shotgun before moving on. The short course length made some riders skeptical, but one trip around the track was all it took put a smile on their faces, it was a fast and fun course. After the teams were decided by a schoolyard style draft, a lemans start sent the fatties on their way down the trail, hugging the shoreline of Silver Creek which promptly spit them out onto the beach for a lung busting sprint up the sand. A wheelchair access ramp halfway through the course allowed the more adroit fat bikers to gain a few precious seconds on those of us new to the ways of paunchy tires. The trail then headed back towards the start, through some ice covered single-track. Seconds mattered as lap times were short, around five minutes, then the next team member grabbed the bike at the handoff and saddled up for a progressively muddier trip around the Shelltrack. The first team to mark down twenty laps was a group of Titletown Flyers from Green Bay. For their efforts they were awarded some bling in the form of a custom made shell necklace. It will be theirs until it is up for grabs again next year at the Shelltrack. This was a great race, free PBR, sunshine and a great reason to get some mud on the fat-bike, all for only $10, it may end up being the biggest bargain of 2012. 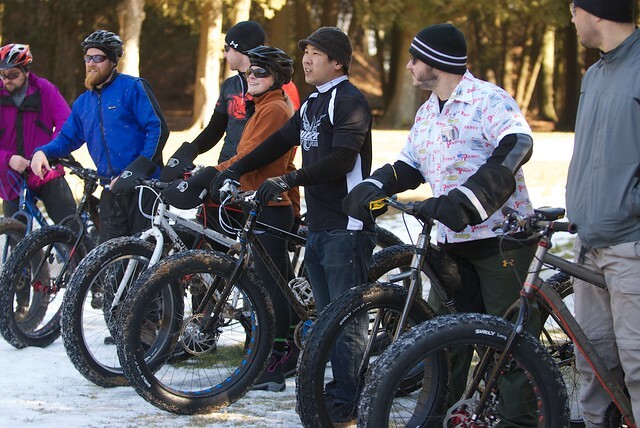 This was the first fat-bike event in Manitowoc but many more will come. With so many wide open beaches and miles of meandering park trails, Manitowoc should be on any fat-bikers’ short list. Hope to see you all out on the beach soon. 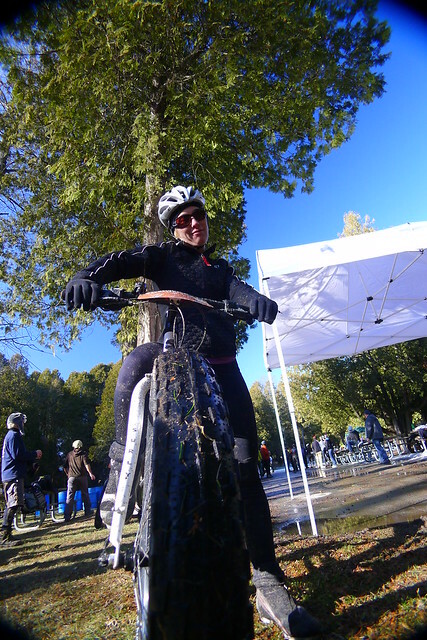 With a lil creative thinking and global warming fat bike races and events are “the place” to be.